Certified Chaos Traders are traders who are graduates of my 4 main courses. See http://moneytide.com -> Courses for details. 9:27 that activity makes the first trade time difficult; Which MoonTide is active? 9:21 that economic report was the First Friday jobs report. This is widely traded by hedge fund computers. They consider a 7 minute trade a long duration, so they are in and out. Then the juice is gone. 3/7/2014 10:24:26 AM MT srj****:: Looks good - Have to spend some time looking at the Rich uncle site and trying it out to see how well I do in figuring out the proper placement of the vortex and everything combined. 3/7/2014 10:18:29 AM MT BBB****:: srj - what do you think? 3/7/2014 10:03:54 AM MT sdg:: Good to see you are doing well. 3/7/2014 9:57:27 AM MT sdg:: @BBB - Where have you been hiding?! 3/7/2014 9:53:53 AM MT BBB****:: chart is in CCT room. Whentotrade is LVT's own platform. If you own the book of his, Decoding the Hidden Market Rhythm, you get access to the platform. I like it - but it does not have any astro stuff. Just easier to set up cycles then in W 59. I had to subscribe to BARCHART for data feed, but that's ok. All in all the tide times are the absolute best thing out there, but I was having trouble seeing if they were a reversal time of continuation, and (for me at least) the cycles have really helped me out. 3/7/2014 9:51:31 AM MT srj****:: Not familiar with When to trade - is that a different platform from W59? Do you recommend it? 3/7/2014 9:50:13 AM MT srj****:: @BBB - no not at present but have been thinking of it. 3/7/2014 9:44:39 AM MT BBB****:: Do you have W59? 3/7/2014 9:41:17 AM MT srj****:: @BBB - Thanks - looking forward to that information. 3/7/2014 9:37:39 AM MT BBB****:: srj - yes I use LVT on his platform from When to trade. I have found using those and trading around the tide times is a pretty great duo to team up with. 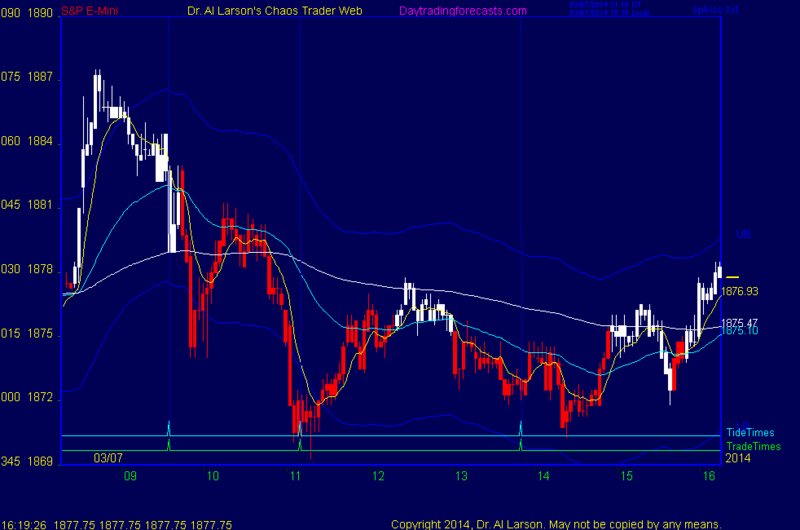 Will put chart in CCT room on cycles. I actually bot 71.25 using the cycles and the Fibonnacci Vortex in W59. I can tell you how I set up the vortex each day and you will love it. TOook me about a month of watching it to believe it, but has been AMAZING at finding tops and bottoms. Will put both in CCT room. 3/7/2014 8:07:06 AM MT BBB****:: my cycles show the bottom is in, but have been wrong before! 3/7/2014 7:09:18 AM MT ljg:: Good morning,will Al be in here today? if so,what time?